Steve Lawson has spent much of his career exploring the front edge of musical and technological possibility, in terms of the sounds that one bass player can make, the ways that musical recordings can be constructed, the ways that musicians can talk to listeners, and the ways that recordings can be distributed to them. He’s not the only one out there ahead of the curve: much independent hip-hop is released straight to YouTube, making the actual audio file something of an irrelevance, and poverty has been a great impetus for innovation in various parts of the world, with mobile phones, CD-Rs and USB sticks being used to distribute music which was probably mastered straight to MP3, by a producer without ready access to the internet; but Steve Lawson has been a real pioneer in developing the ways in which a reasonably (not extravagantly) well-resourced musical artist in the developed world can negotiate the evolving landscape of digital production and distribution. I’d been dimly aware of him since the late 1990s, but his current album when I had my first meaningful encounter with his music was 2011’s 11 Reasons Why 3 Is Greater Than Everything, which was unusual in its disregard for the limitations of CD format. I think that even then there was a general supposition that a digital only release was an artefact of low sales expectations, but Lawson gleefully seized the opportunity to release more music than would fit on a CD, in 24 bit FLAC format, which is better quality than a CD can accommodate. He also offers everything he’s ever released, either alone or in collaboration, including two albums recorded with his wife, the singer-songwriter Lobelia, plus three albums under her name alone, on a tiny USB stick for twenty-five knicker. This music is all presented in albums, which are roughly the shape, size and thematic coherence we might expect of a CD album, but these distribution practices seem to be eating away at the distinctions between them; the idea of an album as possessing specific material parameters is clearly under question. The music on Finger Painting is made of Steve Lawson playing the bass guitar, and Daniel Berkman playing a variety of things, including kora, Gravikord (an electric kora), ukelele, the Roland Handsonic (a hand percussion MIDI controller), his laptop, and, as Lawson put it, ‘all pointy chrome and unusual instruments’. Who is producing precisely which of the sounds you will hear when you listen will be very difficult to determine: some sounds carry the obvious signature of aftertouch on a conventional stringed instrument, slurs and bends and so on, and those can only have originated on the bass; others clearly emanate from the fine strings of the kora or the Gravikord (hard to tell which, but the latter is nylon strung, so there’s a hint of a distinction). Hard percussion attacks clearly come from Berkman’s electronic equipment, elicited by means of his Handsonic, but most of the sounds are not so readily identified. Lawson’s usual practice is to loop and process the notes he plays on his bass guitars, and in his solo performances he frequently produces atmospheric sound effects, or what sound like synthesiser pads, which are layered with basslines, and upper register melodies that sound more like a guitar than a bass, or sometimes like neither; he does all these things on this set, while his collaborator manipulates such a variety of sound sources that all bets are off. I would imagine it would be quite hard to tell exactly what was going on if I was watching them live, but by listening to a recording it’s only possible to form a dim and intermittent impression of what exactly each man is doing. This is, in my opinion, all to the good; you can stop fretting about the nerdy details of their technical activities and just listen to the music. Steve Lawson begins the opening piece with his bass in recognisable form, using harmonics to articulate some chiming, high register chords; this voice is quickly joined by others of less apparent provenance, a warm harmonic soundfield that establishes a spatially luminous atmosphere. I hesitate to use the word ‘ambient’, as it suggests a particular, invertebrate form of orchestration, and there is a discursive phraseology in play through almost all of this album, but the music signifies most powerfully at this point in creating an ambience, a sense of materially located mood, a place. Soon, percussion and a bassline enter, and that place is understood in the sense that we understand most places, by our movement relative to them; when an atmosphere has been established so clearly it only takes the sparest of rhythms to invoke an emphatic sense of journey. Much of Finger Painting gives me the sense of sunlit vistas unfolding to a mobile viewpoint, like driving the road through the Great Glen in Scotland while cloud shadows chase the car along the valley floor. The feeling of the music is predominantly calm, and the atmosphere it evokes is very consistent throughout, although there is a great deal of diversity in the means by which it is achieved. While the sedate progress of the opening ‘Antidote To Everything’ is pretty much characteristic of the set as a whole, ‘Finger Painting’ and ‘Reunion’ both make use of more propulsive grooves without disturbing the glassy stillness of the music. Improvisers can use their music to spell out all kinds of emotional states, from joy and excitement to existential angst and rage, but this pair seem to find their affective focus in the almost transcendental state of reflectivity that musicians can achieve when they are completely involved in the music they are making. If this album is ‘about’ anything, in the way that Coltrane’s A Love Supreme is about God, or Pink Floyd’s Dark Side Of The Moon is about existential anxiety (feel free to take issue with either of those assertions), it’s about making music. Although the duo were not performing for the first time when Finger Painting was recorded, and the music is all modal, slowly evolving material, it still almost sounds constructed; not because it lacks spontaneity, or because it is utterly devoid of technical imperfections, but because it is so stylistically and affectively coherent, from start to finish. 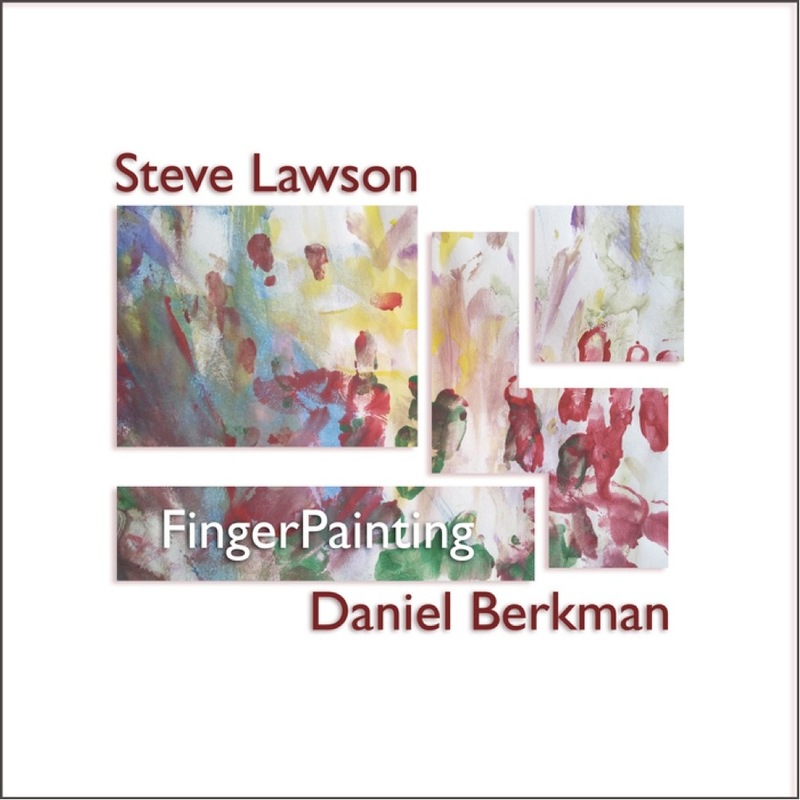 We can reasonably suppose that Berkman and Lawson set out to make some good music when they decided to play together, but it sounds as though they set out to play exactly this, notwithstanding a couple of moments where nascent ideas seem to be abandoned in favour of another tack. They are joined for the last two of these six improvisations by the vocalist Artemis, who was responsible for bringing the two of them together in the first place, and when she sings, her mellifluous Celtic flavoured phrases serve to tie their voices together in such a way that they cease to sound ‘well-integrated’, and sound like one single unified orchestration, all sense of self-expression sublimated to the more generous end of mutual comprehension. Both men are extremely capable musicians, in terms both of their ability to hear and invent engaging and moving sounds, and their ability to realise them extemporaneously; but they both go a little beyond the run of the mill (if there is a run of the mill among such gifted improvisers), in their creative use of technology to transform and expand the sounds they make electro-acoustically. The textures on this album are woven from great complexities of layered sounds, whose characteristics are manipulated carefully in every dimension, tonal, rhythmic, timbral, or whatever; sometimes both men are hovering above a terrain of pads and loops, some running backwards, some morphing and shifting stochastically while the players’ attention is focussed on their instrumental performance, and it sounds as though the music is playing them. Lawson estimates that it will take around two-hundred hours of work to mix and master all ten performances; while that process goes on, there are pre-order options available (through the Bandcamp page for this album, link above) that enable the keen listener to follow the project in detail by access to the Dropbox folder in which the audio files are stored. Whether or not you are interested in such groundbreaking ways of engaging with recorded music, Finger Painting is a taster for what promises to be a spectacularly beautiful and fascinating body of work. In itself it’s a cinematic travelogue through a world of sound; two master musicians, in comfortable command of some very complex materials, with their ears at full stretch. Lawson counts this among the finest music he’s made; I concur. ooh, this has my attention, I will check it out, sounds like something I will like!